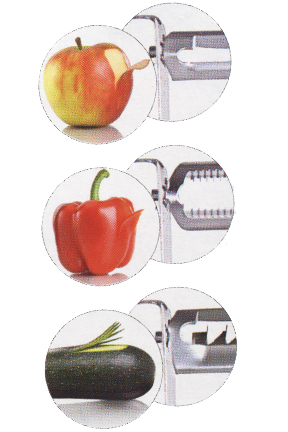 A three piece set of stainless steel vegetable peelers from Zena. The regular Star Peeler is super sharp, easy to use, and a favorite of our customers. This set includes the stainless steel version of the Star Peeler along with two others. You will also get the Star Julienne Peeler, and the Star Serrated Peeler. With this set, you will be able to peel, skin and slice any fruit or vegetable. The high quality materials ensure that each of these is incredibly easy to use, and able to produce professional looking results with every operation. 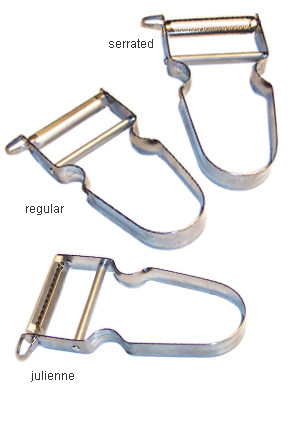 Thanks to the wide grip, and unique design, these peelers are comfortable to hold for long periods of time, ideal for folks with arthritis, and equally easy to use for left or right handed people. Each one features the classic Swiss design, sturdy stainless steel construction, and Swiss construction. With a Star Peeler, you are guaranteed ease of use and longevity, so this set will be a perfect addition to any kitchen , and will offer many years of effortless use. This one features a regular straight blade. 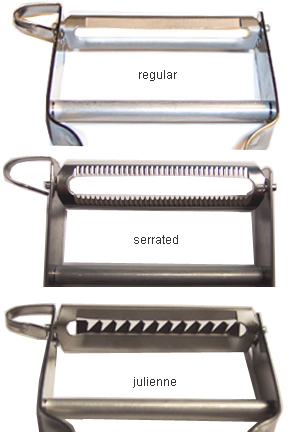 It is identical to the Original Star Peeler except that this one has a stainless steel blade instead of a tungsten steel blade. It is still high carbon, so the quality is superior, but the stainless blade adds convenience, while giving up a bit in the sharpness department. This stainless blade is still incredibly sharp, but you no longer have to worry about rust build-up when putting it in the dishwasher. Tungsten steel will technically stay sharp longer and offer a sharper blade in general. This version offers a very sharp and easy to use blade, that is more convenient for some people. Use this peeler for all around vegetable peeling. It will be great for potatoes, apples, carrots and more. Added pressure will give you thicker peels, and with enough, you can achieve thin slicing. You can make decorative slices lengthwise out of zucchini or squash, or slice a carrot or cucumber on end for perfect round slices. Cut a head of cabbage in half, then shred using this peeler for the perfect cole slaw, or use regular lettuce the same way for a topping on tacos or sandwiches. The serrated peeler has a blade similar to the regular straight blade, but with the addition of many sharp little teeth along the edge. This helps to break the surface, prevent slipping, and make it easier to work with soft or slippery foods. For this reason, the serrated peeler makes it easier to remove the skin from fruits and vegetables with smooth or waxy skin. It can also make softer fruits easier to peel as well. The extra teeth built into the blade will dig in to give you that extra grip and peeling ability to make it super easy to peel things like peppers, kiwis, tomatoes, peaches and more without slipping all over the place and causing frustration. Simply apply even pressure and peel down the length of your fruit or veggie and the peeler will do the rest. You will end up with perfect results with very little effort. This outstanding tool will ensure that you are only removing as much skin as you want, and you are never bruising or smooshing your fruit as you work. An incredibly sharp blade along with an array of additional teeth allow this serrated peeler to be easy for anyone to use, and ideal for peeling food that normally causes trouble fro traditional blades. The blade on this peeler is much different from the other two. It features regular straight blade along with several large, triangular teeth that make up a secondary blade. This design allows it to dig and remove strips instead of peels. The Julienne Peeler is the perfect tool for cutting small batches of julienne shreds for salads and stir fry. With this peeler you are able to quickly reduce vegetables to little piles of perfectly shaped sticks without a knife or any skill. The long pointy teeth on this peeler will dig into your vegetable as you peel to sort of shred it. As you work, you will remove thick shreds, or tiny sticks as you work. This tool is perfect for use with carrots, cucumbers, radishes and more. It only takes a short amount of time to use, and the results are fool proof. Anyone can use this julienne peeler to jazz up a green salad, add garnish to a meal, or prepare ingredients for a stir fry. Each one of these peelers is made entirely out of stainless steel and manufactured in Switzerland. This gives them a higher end look, but also adds to the quality, durability and longevity of the design. The high carbon blades will be super sharp to make peeling easy, but are also dishwasher safe to make this set easy to clean after the work is done. Each one has a built in loop at the top witch can be used to quickly cut out blemishes or rotten parts as you peel. Apply a little pressure, and you can remove long, thick strips of fruit or vegetable using this part also. Turn the whole thing around and the handle can be used to scrape the seeds out of fruit like melons or vegetables like squash. You can even use this part to scale a fish with great results. From slicing, to peeling, to skinning and garnishing, this set of vegetable peelers will have you prepared for all of those little jobs that come up. This is the ultimate set and perfect for any household or professional kitchen. Order Yours Today! Three Piece Vegetable Peeler Set by Zena - Be prepared for every peeling task that comes up. 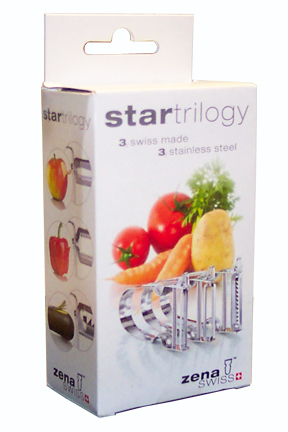 Get three great stainless steel vegetable peelers in this set. Perfect for any kitchen but ideal for anyone that is left handed, or those with arthritis. Order Yours Today. WOW! Love, love these peelers! I have spent 3 times the amount of this set to buy just one peeler. They might look fancy and have nice sturdy handles, but the blades do NOT last! These peelers are easy to handle and work so well!! So glad I stumbled onto your web site and decided to take a chance! Thank you! Well designed and constructed. Great purchase. Has encouraged me to prepare and eat more veggies. Love them. My husband was looking for a product to help me. I have RA and at times my hands hurt too much. Best product u can get looking for peelers. I love the serrated peeler, however I haven't had as much luck with the straight blade peeler. Also I had hoped to get some info with the order on how to use the julienne blade peeler. Simply the best peeler to have! My husband was kind enough to bring this entire set home to me from a expo he went to. They are so easy to use and do a GREAT job. Ordering another set for my daughter in law. Great gifts for someone who cooks a lot....Christmas is right around the corner....great gift! This is by far the best peeler set I have ever purchased. The ease of use, the sharpness of the blades make peeling with arthritic hands so much easier. The julienne peeler does a great job . A pleasure to use. My wife loves the peeler trio. These peelers are very simple, and yet the best I've ever owned! I just love them, especially the serrated one for smooth skinned veggies and fruits. I would purchase these again in a heartbeat!! Best peelers on the market. Light, easy to use and clean. Received and tried out the three peice peeler set. I have to say, when I opened the box and took a look at what I got for the money I paid, I was a little disappointed. It seemed and looked cheap. The peelers work good, but I would probably order my kitchen stuff from someplace else next time. for years i had the star vegetable peeler, better than anything that i had bougfht in a store lasted for years till i misplaced it. so i just had to have another one. so seen the 3 piece set figured i would give the other 2 peelers a try.